In the past, we have showed you how to add a RSS Feed news ticker in blogger with lot possibilities and customizations. However, people are trendier about adding a news ticker in the sidebar of their website. For some obvious reasons, some news tickers are unable to adjust in the sidebar of website because of their large size (horizontal in nature). Therefore, we have developed a flexible, elegant, simple yet highly professional RSS Feeds news ticker for your Sidebar. 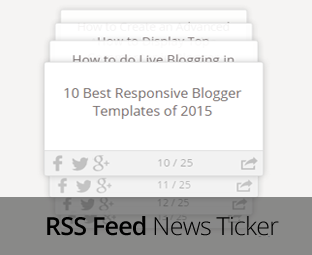 Today in this article, we will show you how to add a RSS Feed News Ticker in Blogger Sidebar. Replace http://feeds.feedburner.com/mybloggerlab with any other feed URL. Replace 100% from the above code, to reduce or increase the width. Replace 5000 with any other digit to increase or decrease the rotation animation of the ticker. Replace #FFF to change the background color of the info bar in the ticker. Replace #f2f2f2 to change the background color of the ticker. Replace #DDD to change the border color of the ticker. Replace #766D6D to change the color of the link appearing in the ticker. Once everything is done, save the widget by pressing “Save” button present towards the bottom of the screen window. Congraltuations, you have successfully added a RSS news ticker widget in blogger sidebar. We hope this tutorial may have helped you in learning how to add a RSS feed news ticker in blogger sidebar. Do share your thoughts about this new improve news ticker widget we have developed by blogspot users. If you like this widget, share it on Facebook, Twitter or Google+. Very nice post bro thanks for sharing ! Not working on my blog :( plz help me. I set up on my blog with correctly. But not working. Nice information, It would be very useful in the future when I start my blog.. Thank you for sharing !! Make sure You have jQuery.js in your blog. Awesome dear! I'll use it when needed.